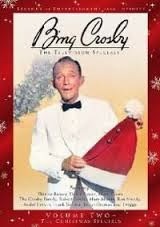 This is a collection of four of Bing Crosby's Christmas specials. I'm not going to go into detail about the individual content of each episode here - we'll do that in separate reviews. Instead, I wanted to talk a little about the experience of watching this as a whole. What I want to talk about is a narrative that you can't help but notice watching this thing. The specials on this collection were from 1961 to 1977; that means he was nearing 60 when the first of these aired. His days as a major movie star were behind him, and his fans were aging. I'm sure a lot of the guests in his first special were famous at the time, but damned if I've heard of many. Crosby almost always has a sort of laid-back style to his acting and singing, as if he knows it doesn't matter if he tries or not, because the world will love him, anyway. I don't think that's what's really going on, but I think he was trying to convey the idea. He was too cool to take any of it seriously, and he always saw some joke that everyone else - audience included - was missing. The first special is bizarre, even by the standards of Bing's Christmas specials. It's filmed in England, and features very little content to distinguish it as a Christmas special - the only holiday song is the last: he closes with the song he was most closely associated with: White Christmas. The second, from 1962, is notable mainly for being the first of these shot in color. They joked about this, and made sure there was no shortage of colorful props around to exploit the technology. The set designer didn't seem to get the memo, though: this was filmed in a dull, grey hall. Most of this was devoted to Crosby trying to impress Mary Martin. The end featured three Christmas songs, the last of which was - of course - White Christmas. The third jumps ahead to 1971. At this point, Crosby is nearly 70, though he doesn't look much older. Robert Goulet and Mary Costa are featured in this, along with Crosby's wife and kids. This thing is Christmas start to finish: the set is decked out for the holiday, and the music is geared towards the holiday. Putting Crosby's family on television probably wasn't the best idea: they don't exactly pull their weight. Do I even have to tell you how they close this? At least there are some jokes about who will sing it, before Crosby reminds them this isn't a democracy. The last special opens with an introduction by his wife, explaining that this was recorded earlier. The explanation is necessary, because Bing Crosby was dead by the time it aired. Appropriately, this one was filmed in England, just like the first. His family is back: this time, there's a frame story about them going to visit some long-lost relative overseas. It was only filmed six years after the previous special, but it's obvious the years have caught up to Crosby. He looks tired and can't move around like he used to. What most stood out to me, though, is that he actually seems far more engaged than before. In the earlier specials, I always felt like he expected the audience to woo him: here, it's the opposite. He's trying to remind people why they used love him, or perhaps why their parents loved him. He's trying to stay relevant. This is the special featuring the famous duet with David Bowie. In the special, Bowie doesn't know who Bing is. It comes off as an acknowledgement not just that he's aging, but also that he's fading from the public consciousness. There are also a couple sequences involving ghosts Crosby encounters in the English house he's visiting. If the scenes were less substantial, I suspect they'd have been cut, but the first - involving the spirit of Charles Dickens - leads into an extended sequence with Twiggy, and the second was played by Bob Hope. The Hope section is bizarre - other than giving the two one last chance to share the stage, it doesn't add much. But the Dickens portion is fascinating. There'd be a melancholy subtext to the sequence even if Crosby hadn't died soon after. With that knowledge, it's almost impossibly tragic. The special ends the only way it could: with Bing singing "White Christmas" one last time. Well, technically, he probably lip-synced it, but... stay with me here. It was strangely affecting. Here's a guy who was, at one time, the most popular man alive. And, at the end, his career just boils down to that one song. Watching it, I found myself wondering if he'd come to love it or hate it. It had come to define his life. And, it turned out, his death - this is the last thing the world would see him do. At any rate, I can't recommend sitting through all these specials to experience the unintended tragedy that ties them all together, but I did find the experience surprisingly fascinating.